Svitlana Niskoklon is an MBA student at the UNC Kenan-Flagler Business School, where she studies finance and entrepreneurship. She holds a B.S. and an M.S. in accounting and management from Donetsk Technical University in Ukraine. Svitlana has ten years’ experience in banking and financial services with various European financial groups. Svitlana has lived and worked mostly in Ukraine; her international experience includes work in Greece and Ghana, where she was involved in developing risk-management policies for SME customers. By participating in various civil projects, Svitlana has been supporting Ukraine’s reform agenda and its economic recovery. 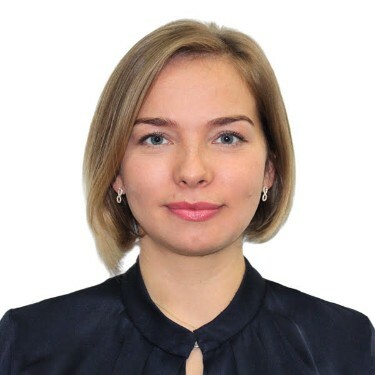 Svitlana’s current business interests lie in emerging financial technologies, including de-centralization and blockchain, and their potential for decisive impact in emerging-market economies. Svitlana is president of the Blockchain Club and EVP of the Adam Smith Society chapter at the UNC Kenan-Flagler Business School.In her spare time, Svitlana enjoys reading and traveling. She has been to 45 countries so far and hopes to visit all 195 countries. Please tell us about your experience working on economic reform in Ukraine. What have been the results of such reforms? As an external expert, I was helping a team of professionals from the World Bank and the Ukrainian government to develop a concept of a national land market in 2016–17. Ukraine has been undergoing an unprecedented transformation since the Revolution of Dignity in 2014. Agriculture land reform—lifting the moratorium on agriculture land sales—is the most powerful measure that the government can take to boost economic growth and job creation, particularly in rural areas. The World Bank calculated that land reform could result in adding $15 billion to the annual output of the agro-industry and increase annual GDP by about 1.5 percentage points. The economic case for lifting the moratorium is clear; but unless it is done transparently, the risks may outweigh the benefits. I used my extensive experience of working with the agriculture sector from the lender’s side to transmit the voice of stakeholders—agriculture companies, banks, and landowners—to the reform team. In addition, I presented the state of existing agriculture lending practices in Ukraine to the World Bank team. My contribution resulted in changing several norms in a final law and making the concept of the national land market more transparent, inclusive, and economically efficient for market participants. Based on the developed concept, the government passed several important laws and resolutions, such as one on amendments to the law of Ukraine on state land cadastre; and on conducting a Ukrainian-wide normative monetary assessment of agricultural lands. The government launched a new electronic service for online registration of agricultural land-lease agreements and an online service for registration of land plots. Market experts at almost every meeting of the working group highlighted a vulnerability of land title rights under the existing system. As a result, the government passed a number of resolutions on land-use monitoring and maintenance, which will be done via a modern, blockchain-based state land cadastre. How has your international experience influenced your views on public policy? Working in different countries helped me understand the importance of an international perspective in creating public policy. Modern public policies should address issues from the perspective of people living not only in a particular country but in other countries as well. Christine Lagarde, managing director of IMF, stated that international cooperation underpinned a phenomenal rise in incomes and living standards around the world. Thus, for developed countries, which account for a major part of global trade, as well as for developing countries, which are highly integrated into global value supply chains, public policies should be intertwined with global issues. Public policies should address international connectedness, interdependence, and the complexity of the world and the professional field. Each can and should be manifest in a free society’s public policy. What sparked your interest in blockchain technology, and what potential do you think the technology has? Blockchain technology provides a unique opportunity to improve how we cooperate, transact, invest, and trust. Blockchain technologies and new ways of building trusted networks can help us reshape economies, industries, and civil societies for the better. Blockchain enables two people or companies to securely transfer value from one to the other, without an intermediary such as banks, PayPal, or Western Union. A great potential impact of blockchain on the world economy would be through solving the problem of financial inclusion. According to the World Bank, 1.7 billion adults—30% of the world’s adult population—are technically unbanked. Those people have no access to regular banking because a bank doesn’t find it profitable to provide services in regions where unbanked people live, or the people have no proof of identity. Without ID or a passport, one cannot open a bank account. Most unbanked people live in Africa, but you would be amazed to know that even in the U.S., with its developed banking system, 9 million households are unbanked, as per the 2015 Federal Deposit Insurance Corporation’s report. Cryptocurrency is the perfect way to bring financial services to everyone. More than a billion unbanked people have smartphones. With a smartphone or laptop and Internet connection, anyone can use bitcoin to send and receive money. Not only is it fast and cheap; it’s also more secure than mobile banking. The technology is flexible, and the barriers of entry are low. Other blockchain projects solve the identity problem though using biometric identity for creating an identifiable bank account. The consulting company Accenture calculated that bringing unbanked adults and businesses into the banking sector could generate an additional $380 billion in revenue for banks. Blockchain technology will be a game-changer for the world economy. Out of the 45 countries you’ve visited, which is your favorite and why? I don’t have a favorite country. Extensive traveling revealed to me the beauty of diversity and complexity of the world. Meeting and interacting with people from different cultures, learning their life stories and their systems of values, and discovering new cultures have drastically changed my mind-set. I realized that drawing conclusions about people based on a first impression is an extremely harmful habit. Studies show that we judge people based on the first impression that we build in seven seconds. The first impression leads to judgment calls that limit us in many ways. Though traveling, I met many people who were nothing like my first impressions of them. Traveling opened my eyes to how multifaceted people are. I no longer allow a first impression to limit my ability to get to know someone beyond a superficial level.